Dr. Jacqueline Subka, a highly trained dentist in Thousand Oaks, CA, welcomes new patients with receding gums in Calabasas, CA to receive the Chao Pinhole® Surgical Technique, the minimally invasive gum graft alternative. Dr. Jacqueline Subka expands her patient base to welcome new patients with receding gums in Calabasas, CA, to experience the Chao Pinhole® Surgical Technique (PST™). Dr. Subka practices in Thousand Oaks, and is proud to extend this service offering to nearby patients. PST is a revolutionary, minimally-invasive alternative to traditional gum grafting that corrects areas of gum recession and minimizes symptoms like elongated, loose and sensitive teeth. A graft-free solution for candidates with enough existing gum tissue, this technique allows Dr. Subka to navigate specialized equipment through only a tiny hole in the gums. During the procedure, she gently shifts connective tissues into more natural, healthy positions without the need for cutting or sutures. The outcome is an instantly revitalized smile for the patient, and less downtime, swelling and discomfort than is frequently associated with traditional gum grafting surgery. Gum recession is a common problem that can lead to heightened tooth sensitivity as tooth roots and bone become exposed to heat, cold and air. Left alone, receding gums will not return to their previous state without professional dental intervention. If the gums continue to recede, the patient risks a higher chance of developing cavities, periodontal disease or even tooth loss. To set up an appointment to meet with Dr. Subka in her advanced practice and talk about receding gums or treating loose or sensitive teeth, please contact the practice at 805-373-1919. Dr. Subka promotes a judgment-free, technologically advanced and family-friendly atmosphere that appeals to patients of all ages. Dr. Jacqueline Subka is general dentist offering personalized dental care for patients in Thousand Oaks, CA since 1999. Dr. Subka received her dental degree from the prestigious University of Southern California School of Dentistry in Los Angeles. Dr. Subka practices gentle dentistry and incorporates state-of-the-art techniques to provide leading, minimally invasive care. She and her team are committed to continuing education and strive to provide high-quality, personalized dental care to each patient. 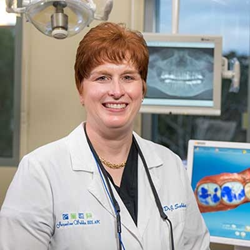 To learn more about Dr. Subka and the dental services she provides, visit her website at http://www.subkadds.com or call 805-373-1919.